Michelle from Milton, Ontario, wrote to us in February and said ..... Today I saw a Bald Eagle flying overhead in Milton. I had to look again to make sure and it was definitely a Bald Eagle. I tried to follow it in my car but couldn't keep up with it as it flew west. Just amazing. A reader from Vineland Station wrote to say ..... A Bald Eagle was seen at 10:00 am on February 15, 2014. The Eagle was sitting in a tree near the Lake Ontario shoreline, next to our home in Vineland Station. Hector Boyle of Fergus, Ontario, told us about the beautiful bird he spotted ..... just saw a Bald Eagle in the skies above Fergus, flying along the Grand River, I guess looking for food, ie: a break in the ice. I am sure they're struggling for food right now with the river frozen. I hope he or she makes it ok.
Tara from Cottam tells us about the Bald Eagle she sighted in Ruthven, Ontario ..... Driving in my vehicle today February 23 2014, this large bird flew over top of us. At first we thought "Wow that's a big hawk" then we took a double take because it was brown with a white head, and we could see the yellow beak. We couldn't believe it then when we decided to look to see if anyone else has seen them her in southern Ontario, and yes they have, but this was the first time we had ever seen one ourselves .....amazing! Tim from Smithville, Ontario wrote to say ..... My family and I were driving down Thirty Road near Young Street in West Lincoln. In the distance we saw a large bird flying so we pulled over. Sure enough it was a Bald Eagle! First time I have even seen one in the wild. Amazing! I wish I had my camera with me. winter morning. I had to look twice to be really be sure, I've never seen a Bald Eagle in Ontario! I'm so very glad this endangered species is coming back. Al McElroy from Ayr, Ontario wrote to say ..... It's March 1st, 2014 - I was just driving down Watts Pond Road heading into Paris. I saw a huge bird flying south, and my brain automatically thought "What is a Blue Heron doing here at this time of year?" But then the image clarified, and I realized it was an Eagle - possibly the largest I've ever seen, I thought perhaps it could have been a Golden Eagle, but that is unlikely. I really should keep a camera in the car. Heather Bonsell of Frankford wrote to tell us ..... On March 2nd while I was travelling home to Frankford along Highway 33 at around 3 p.m. on a sunny afternoon, I saw a Bald Eagle sitting in the middle of a field of white snow eating a small animal it has just caught. You could see the prints in the snow from the animal before she caught it and then the signs of the struggle in the snow. I caught the majestic sight of the Eagle as it flew into the trees after eating. The wing span must have been at least 6 feet across. This is the first one I have seen in the wild and it was awesome! 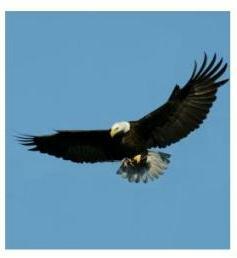 Jessica from Bowmanville, Ontario, wrote about her Bald Eagle sighting ..... This past Sunday, March 9th, we spotted a Bald Eagle flying overhead while driving along the River Road from Peterborough to Lakefield. I slowed the car right down and had a good look and am positive it was a Bald Eagle. Was very excited to see this and actually turned around in Lakefield and drove the same way back to see if we could spot it again. No luck!! Hopefully they are making a come back in Ontario, would be lovely. Thank you all so much for writing to tell us about your Bald Eagle sightings - they are magnificent creatures and the number of sightings leads me to believe that they are making a tremendous come-back across Southern Ontario. I was leaving for school around 8 am and saw a giant bird, turns out it was a Bald Eagle! I had no idea they were in this area. It was overtop the new survey in Smithville! I saw a Bald Eagle in Smithville today. It was flying over a field off Thirty Rd, near Yonge Street, probably the same place as a previous commenter noted. So cool! I didn't realize we had Bald Eagles in our area. I have seen him on numerous occasions around the garbage dump on First Line south of Britannia Road. Heard it is there to control the gull population around the dump.